A US man jailed for murder after a white nationalist rally in Charlottesville has pleaded guilty to hate crimes at a court hearing. 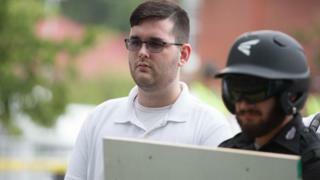 James Alex Fields, 25, a professed neo-Nazi, was convicted on 29 of 30 counts in a deal to avoid the death penalty. Fields was sentenced last December to life in prison after driving his car into counter-protesters in 2017, killing one person and injuring dozens. He previously claimed he acted out of fear for his safety. Fields travelled around 500 miles (804km) from his home in Ohio to attend the Virginia rally. The "Unite the Right" march was organised to protest against plans to remove a statue of General Robert E Lee, who fought for the pro-slavery Confederacy during the US Civil War. Counter-protesters turned out to oppose the rally and dozens of people were injured in violence that erupted. One, 32-year-old Heather Heyer, was killed when Fields drove at the crowd. Graphic video of the incident was widely shared on social media. In the aftermath, President Donald Trump was criticised for saying there had been "very fine people" on both sides in Charlottesville. Charlottesville: Who is suspect James Alex Fields Jr?